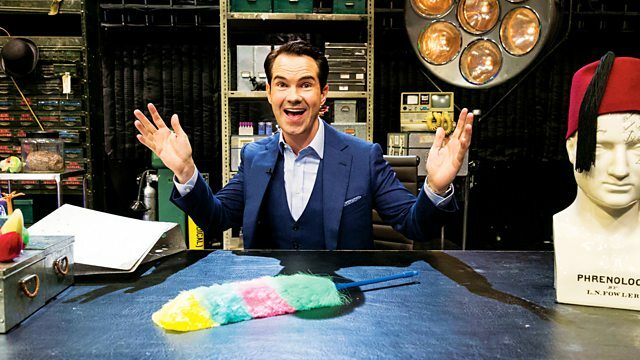 Jimmy Carr takes over Horizon for a one-off special to try to get to the bottom of what laughter is, why we enjoy it so much and what, if anything, it has to do with comedy. Comedian Jimmy Carr takes over Horizon for this one-off special programme, produced as part of BBC2's sitcom season. Jimmy turns venerable documentary strand Horizon into a chat show, with eminent laughter scientists as guests and a studio audience to use as guinea pigs. Jimmy and his guests try to get to the bottom of what laughter is, why we enjoy it so much and what, if anything, it has to do with comedy. Between them, and with the help of contributions from other scientists on film, Jimmy and guests discover that laughter is much older than our species, and may well have contributed to making us human. With professors Sophie Scott, Robin Dunbar and Peter McGraw.